Anchor clients are great. You can count on them to hire -- and pay -- you monthly. They usually make up a good chunk of your writing income, and they just make planning your freelance finances easier. I had one such client. I won't name names, but it was one of the largest corporations in America. They were a client of mine since 2009, and I took on increasingly more responsibility with them over the years. They went from a meager $300 a month or so to a whopping $7K a month in the last year that I worked with them. They communicated well, paid consistently, and were a dream to work with. Then, everything changed. My regular contact in the Digital Marketing Department moved on. There were some firings. We had several conference calls with a new head of content who seemed disconnected from the mission we had developed over the years. The content team was assured that while our work's scope may change, we were not going anywhere. After about four months of getting little work, I became nervous. My income had already dropped significantly, and I envisioned that the worst would happen and my client would drop me. Deciding to take everything "in-house" and to work with video influencers instead of written content creators, they ended our contract. I went from making close to $50K a year my highest year from this client to nothing. I felt stupid for not seeing it coming, and I began to scramble. Supporting a family of 8 is not easy. With 6 kids, a farm, and a homeschool to run, we use every penny we earn from my business. We live frugally, but we had been taking a slow hit from this anchor client over the previous six months, always hoping we would make it up with them later. This was the wrong move. I was now looking at making less than $25K overall for the year -- not nearly enough to raise my family, pay bills, and replace the many items that my husband lost in a shop fire that same year. We were looking at a big hole of debt and no way to pay it off. Something needed to change. I took a long, hard look at my freelance writing business. 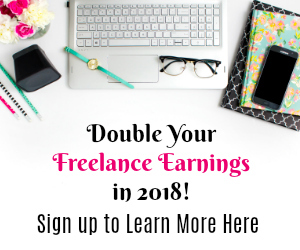 Made up of income from this blog and LillePunkin.com, as well as a few social media clients, and five regular writing clients, my business had so much opportunity, but there were certainly things holding it back. It was time to be honest and make some big changes. In June of 2017, I was on target to make no more than $25,000 a year -- if all things remained the same. This was not acceptable. 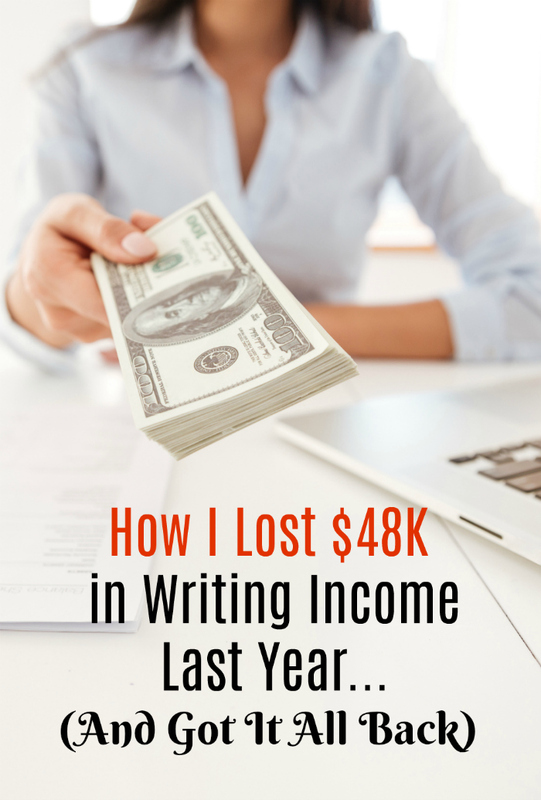 I gave myself until August of that same year to double my writing income or quit. Yes, I was more than prepared to give it all up and go back to work full-time. I knew that I could get a job writing full-time for an agency with a salary of $65K a year, plus benefits, so my freelance goal was to double my current earnings and work fewer hours than I would at a full-time job. But, could I do it? The answer is YES! Several big leaps of faith were made, but I am now happy to report that I am well on track to make more with freelance writing than I ever have before. I have more clients, each paying 2-3x what my original clients were making. I no longer have to spend hours a week applying for jobs that are a mere cattle-call for hundreds of unqualified writers I have to compete against. No more bottom-dollar pricing negotiations. I pick my price, and clients pay it. I also upped my networking game. I joined one very prestigious writing association that has propelled my career forward in ways I never could imagine. I got a book agent. I am scheduled to speak at national conferences in 2018. I have clients emailing ME asking me if I'd work for them. It's been a complete and total game changer. I've been putting everything I've learned from 10 years of writing, complete with the life-changing hacks I've picked up over my leanest four months, and put everything together into one whopping presentation. This will soon be made available for anyone to use -- at a price I think most of us can afford. In fact, I plan on giving all of the lessons I've learned, with tips and tools for real-world application, to writers of any experience level for less than $250! The course is now available HERE. We have gotten great feedback from the Beta group, and I'm hoping it's the key to helping you make 2018 your year! Here's hoping this year is better for all of us. I'm confident there's enough work to go around (in fact, stats PROVE it.) Don't miss out on those strategies that work for the average writer who works hard and has the skills for a career that pays you back. Great article, Linsey. Happy for you. Your reward for perseverance and hard work! Sounds like you put together an amazing course... So proud of you, Linsey! Thank you, Tara. I hope it helps lots of people. You SO deserve it! Muah! Awww.. you're the best, Liz! Hope to see you at blogging event soon!